As a musician in jazz band all throughout high school and jazz band, I struggled with improvisation. As a teacher, I always jump at the chance to hone improvisational skills with my students. When I received a Martha Holden Jennings grant in 2004, entitled "Musical Creativity, Improvisation, and Composition," I searched for literature and methods to achieve improvement in those areas. 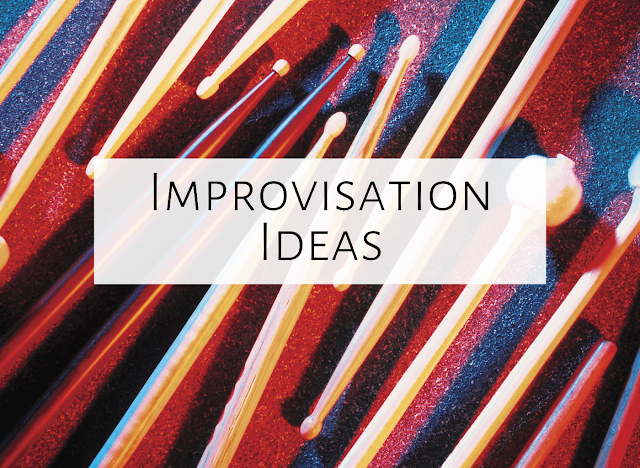 I've found that working on improvisation is actually quite accessible and non-threatening, by providing students with the right tools, where no "wrong answer" exists. The following list contains some of the activities I used with my students. Rhythm Card improvisation: After reading through rhythm cards with the new rhythm, I have students go to the barred instruments set up in C, F, or G pentatonic (taking down the bars not needed). First, they say the pattern from the card, then they play it, using whatever pentatonic notes they choose. It actually sounds quite beautiful, and is a great way to practice the new rhythm. "Somebody's Knocking on your door": After the students know the song well (in the key of F), have students snap three times after the first beat of each whole note. Then, they play the barred instruments in F pentatonic instead of snapping, playing whichever notes they choose on those beats. Drumming Babble: Play a pattern on a hand drum, and have students echo. After a few times, tell them you will play a pattern and they have to play something different. For example, if you play Ta Ta Ti-ti Ta, they might play Ti-Ti Ti-Ti Ti-Ti Ta. 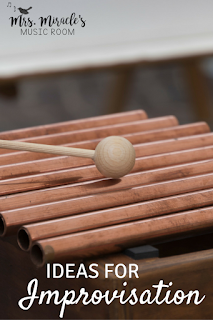 This activity can also be used for solos for any students who are interested, and can be expanded in several ways—as a question/answer activity, as a way to begin drum circles, and as a means to practice a new rhythm. 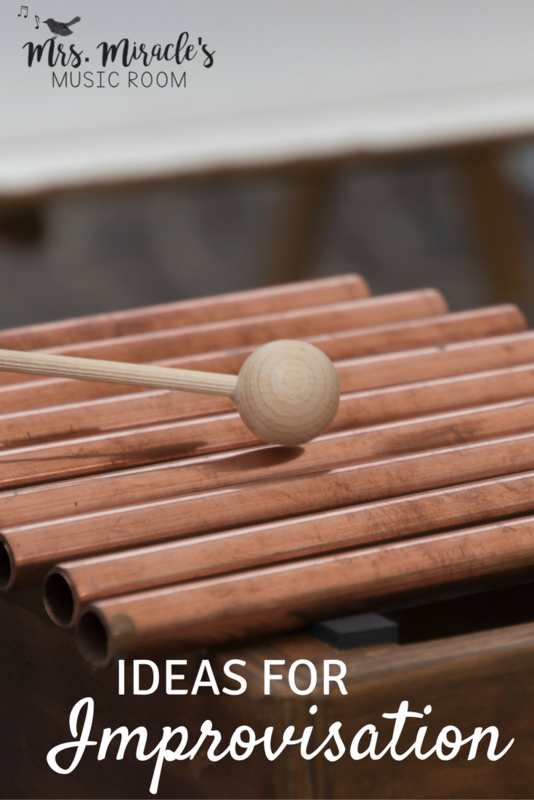 Watch the Conductor: Have several non-pitched instruments spread out throughout the room (the instruments I've found work well are the rainstick, thunder tube, gong, temple blocks, and wind chimes, to name a few.). 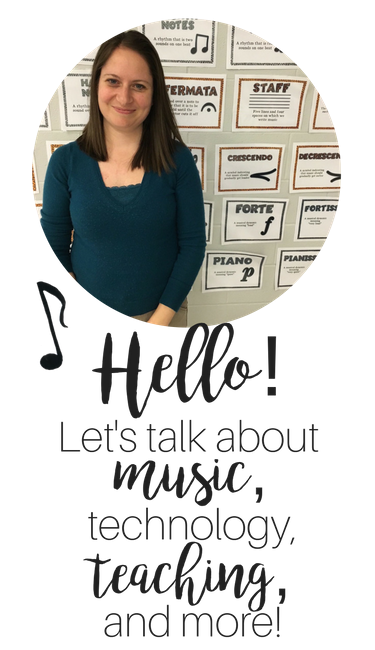 Have students go to an instrument, and tell them they will decide what they are going to play. When you point to them, they play whatever they want, but they have to watch your cues, showing them to get louder, softer, or to stop. I've done this so that instruments layer on top of one another, until all instruments are playing, then one by one, instruments drop out. After the students are comfortable with this activity, have a student volunteer come to the front to be the conductor. The students have to watch him/her; the conductor decides who and what will play when. I used this activity on the grant concert, and the students did very well with it--they took much ownership, especially the conductor! In any jazz solo, the musician has guidelines to follow--chords, length of solo, and a melody to play off of. The same can be done with our music students--we give them guidelines to follow, and the tools to perform, and they joyfully succeed. Improvisation can be accessible to all students! ...How about you? Any improvisation ideas you'd like to share? Do you have the version of "Liza Jane" you used available on tpt? Thanks so much, that helps out. You have awesome materials and ideas!